Smush Crayons are the accidental invention of designer, Todd Oldham, who once turned a box of crayons into a colourful mess by leaving them in a hot car all day. 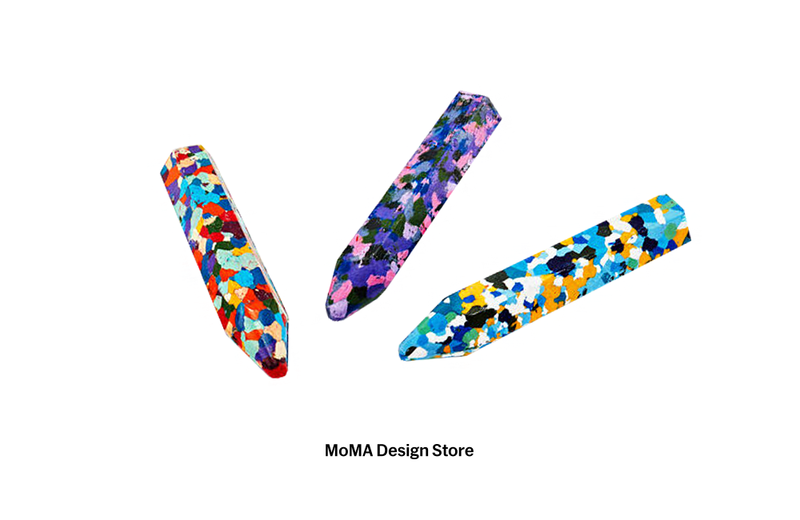 Oldham has teamed up with the Museum of Modern Art (MoMA) to produce three Smush Crayons with colour palettes derived from famous artworks from MoMA’s permanent collection. The Multi Monet crayon is based on French Impressionist Claude Monet’s Water Lillies series of paintings. Multi Thomas draws inspiration from Alma Thomas’s abstract painting Untitled. And, Dutch Impressionist painter, Vincent Van Gogh, gets smushed based on his painting, The Starry Night. Made entirely of wax, each Smush Crayon is 5.25”h x 1”w x 1”d, roughly the size of a large pencil. Each crayon is packaged in a triangular box that includes information about the museum and the artwork. Smush Crayons are sold separately and may be purchased directly online from the MoMA Design Store at a cost of $6 USD each. Move over Little Tikes Cozy Coupe; there’s a new ride in town! The Jurassic Park Jeep will be officially unveiled at New York Toy Fair in February. Three officially-licensed Star Wars candle sets from Numskull bring the trilogy to life in scents.